(Host) All this week, the country’s best Nordic skiers have been competing in Craftsbury on a razor-thin ribbon of snow winding through hilly, muddy woods and windy fields. The Super Tour finals looked a little iffy when temperatures climbed in Vermont last week. But organizers hatched an ingenious plan to ward off early summer. VPR’s Charlotte Albright dropped by earlier this week to check it out. (Albright) As soon as you arrive at the Craftsbury Common Outdoor Center, signs beg you to keep muddy boots off the scarce snow. Volunteers have been doing some unusual spring cleaning. (Hall) "My name is Charlotte Hall and I live here in Craftsbury. The Center gives us so much it’s nice to give back." (Albright) "How do you do that?" (Hall)"Well, Saturday and Sunday we cleaned every skier’s boots to keep the dirt and grass from getting into the start area." (Albright) The owners of the Outdoor Center, Bill Dreissigacker and his wife Judy Geer, were literally sweating out this event a few weeks ago. 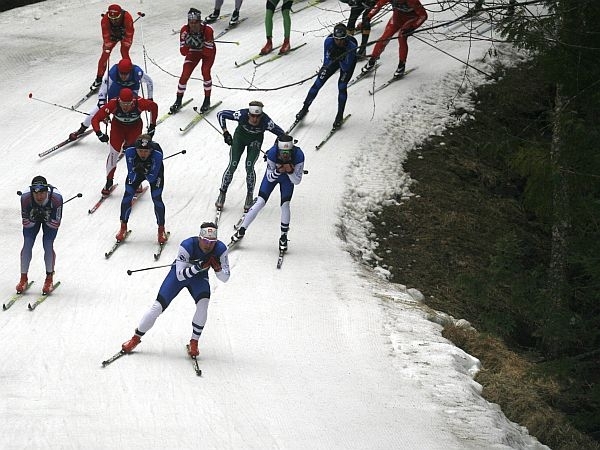 Most cross country ski centers rely on natural snow. But the Craftsbury center has a snowmaking system that pumped a carpet of snow all season and has made this week possible. Walkie-talkie in hand, Judy is helping to keep the event running smoothly. She says there would be no snow at all except for a huge pile that the race crew made and stockpiled over the winter-and then spread, little by little, to keep the 2.5 kilometer trail covered. (Judy) "We’ve, as you can, see used it up now, so pretty much all the snow is out there. We have a wonderful crew here, many of whom are skiers themselves. In fact several of whom are racing and made the heats today. It’s just wonderful that they will stay up all night and move snow, get up in the middle of the night and make snow, and because they’re skiers they know what we are trying to." (Albright) Another part of that mission is to use sustainable practices and preserve the land. (Judy) "So as we make this snow, we are using bio-diesel. We’ve got solar panels over here. We are trying to offset the energy requirements that are made. We will be using the excess waste heat from the snowmaking generator to heat one of our buildings next year. (Albright) This week, she says, they’re sustaining winter. After finishing her race, Holly Brooks, from Alaska, tips her ski pole to the people who made this event possible. (Brooks) "It’s great. You know, I’ve heard a lot about Craftsbury and skiing in Vermont. It’s kind of a heartland for skiing and I really hope I can come back here when the full 90 K is groomed and ready to go." (Albright) That won’t be THIS week. Many of the racers say the strange weather and trail conditions have been dogging them all season, even in Europe. They say they are getting used to skiing on a skinny strip of snow, though if you do fall off the track, your skis can get covered in mud. (Host) The Super Tour event at Craftsbury Common Outdoor Center continues through Saturday.